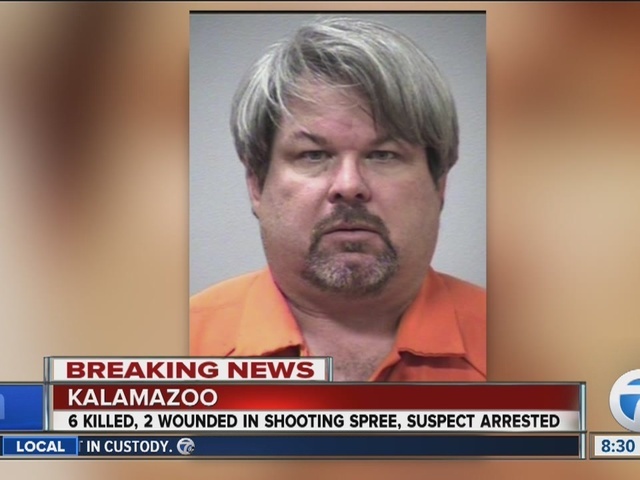 A gunman who authorities believe chose victims at random shot people in the parking lots of a western Michigan apartment complex, car dealership and restaurant, killing at least six and seriously injuring two others — including a 14-year-old girl — during a rampage and subsequent manhunt that spanned nearly seven hours, authorities said. 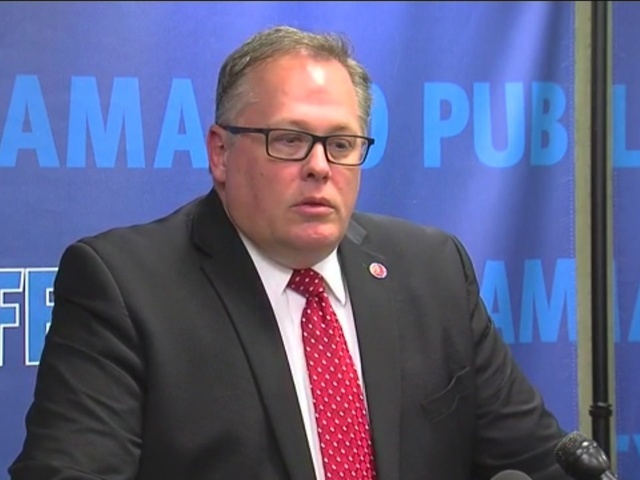 Forty-five-year-old Jason Dalton of Kalamazoo County was arrested early Sunday in downtown Kalamazoo following a massive manhunt after the shootings began early Saturday evening, said Kalamazoo Department of Public Safety Chief Jeff Hadley. Hadley said Dalton, who is being held at the county jail, has no known criminal history. "The victims and their families -- and the entire Kalamazoo area -- should be in everyone's thoughts today. Members of the community and law enforcement officers from the Kalamazoo Department of Public Safety, Kalamazoo County Sheriff's Department, Kalamazoo Valley Community College and Michigan State Police who quickly came together are to be commended for their cooperation and swift response. Their actions resulted in the suspect being caught before he was able to harm anyone else through these senseless and apparently random acts of violence." A little more than four hours later and 15 miles away, a father and son were fatally shot while looking at cars at the dealership. Fifteen minutes after that, five people — including the teenage girl who police originally said had been killed, based on a pronouncement by medical officials — were gunned down in the parking lot of a Cracker Barrel restaurant along Interstate 94, Matyas said. Police said Sunday morning the injured teen remained in serious condition. Matyas said authorities did not believe the shootings were targeted at specific people, describing them as "our worst case scenario." 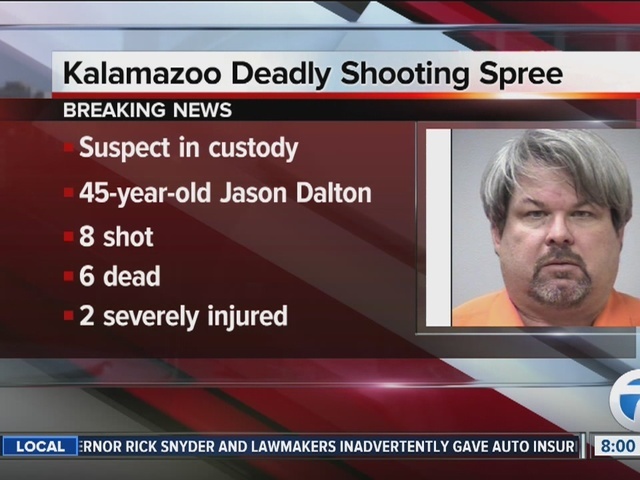 Dalton was arrested in a neighborhood about 12:40 a.m. after a deputy spotted his vehicle driving through downtown Kalamazoo, authorities said. Matyas said Dalton did not resist when approached by law enforcement officers, and one gun in the car. Matyas declined to disclose anything else police may have found in the vehicle. "We had no problem with him," Matyas said of Dalton's apprehension. "In this particular case, we're just thankful it ended the way it did — before he could really kill anybody else." Police said each of the shootings was random and Dalton was the only suspect. "There's no common denominator with any of these," Matyas said, before detailing each shooting. "This person was just waiting in the parking lot of the apartment complex. The one at ... the dealership, they were looking at cars. The ones at Cracker Barrel, they were just sitting in their cars. "There is absolutely no common denominator ... through race, age, anything." "This is every community's nightmare — when you have someone going around just randomly killing people, no rhyme, no reason," he said. "Obviously, we're going to interview the individual and we're hoping to gather ... what he was thinking, what type of methodology he used, if any, in these killings." Kalamazoo, with a population of about 75,000, is about 160 miles west of Detroit. It is home to Western Michigan University and the headquarters of popular craft beer maker Bell's Brewery. The city also is known for the anonymously funded Kalamazoo Promise program, which has paid college tuition of students who graduate from Kalamazoo Public Schools for more than a decade.